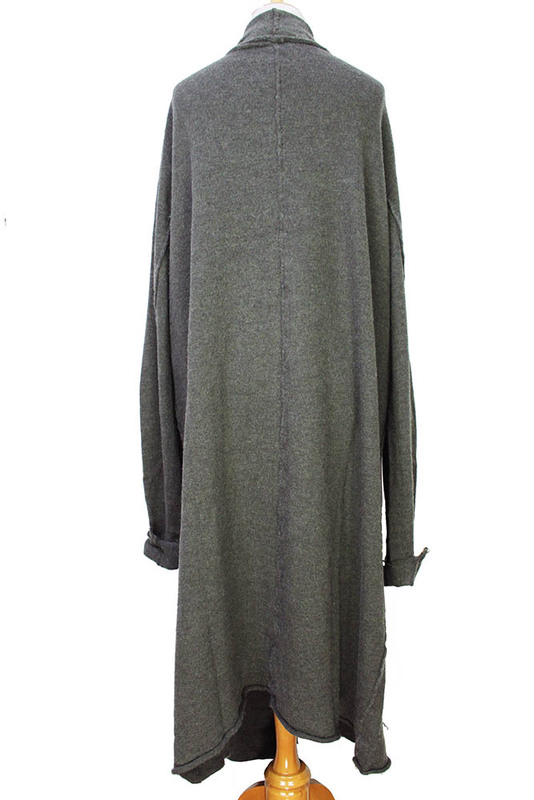 Pal Offner beautiful soft, knitted coat in merino wool, sage colour (weed). After this garment was made it was washed at 70 degrees to create the soft, unique felted look, guaranteed to be warm and extra comfortable. Large kilt pin fastening. This process reduces the size of the garment by around 30%, each piece is unique due to the natural processes used and irregularities in the over all shape. Generous shawl neck. Extra long sleeves, ideal for rolling and gathering. 2 very large patch pockets. Seam details throughout. A beautiful garment, stylish and luxurious, highly recommended. Very generously sized to allow for a wonderful drape!